Best Buy offers us a lesson in gender diversity. The best man for a job is a woman, times three. Financial Officer Sharon McCollam, President eCommerce Mary Lou Kelley, and US Retail President Shari Ballard have architected the turnaround of Best Buy under the leadership of Chief Executive Officer Hubert Joly. They serve as three shining examples of women leaders that saved the day by saving Best Buy — when turnarounds are not for the faint of heart. Fortune Magazine tells the story and it is a good read. 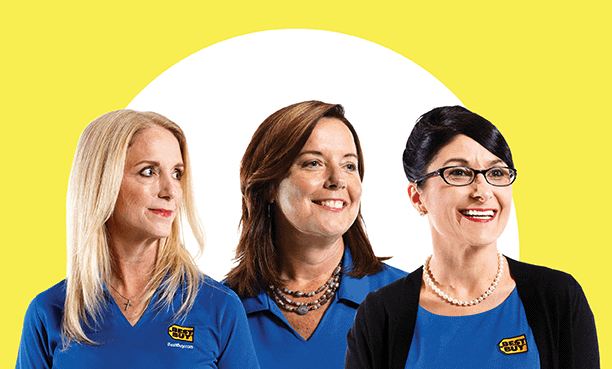 Despite the store’s gadget-geek stereotypes, Best Buy’s leadership team is largely female: Women run operations accounting for 90% of its revenue. Best Buy CEO Hubert Joly was inspired by a McKinsey colleague’s gender-diversity research—on which Sheryl Sandberg’s Lean In is partly based—and decided to give women leaders a shot. His investment has paid off, big time. Fortune Magazine reported turning around Best Buy was particularly validating for chief financial officer Sharon McCollam (pictured on the right above), a veteran of Williams-Sonoma who was lured out of retirement by the CEO. Where Are the Women Today? With that accomplishment firmly in place, Ms. McCollam stepped out of that role back into retirement, where she continues to guide corporations at the board of directors level. She joined Hallmark Cards, Inc.in that capacity in 2017.